Again today, I went looking for Great Gray Owl’s in the Dunrobin area, with very little luck. I know they are around but seem to be moving throughout the area instead of staying one spot like other years. We put on 75km without even a sniff. During these times it never hurts to ask for help. I saw a local resident plowing his laneway and decided to ask if he’d seen any Great Gray Owl’s in the area. He said he hadn’t seen any big owls and I figured well at least I tried. He then told us that there was a small owl hanging around his workshop. He certainly got our attention. 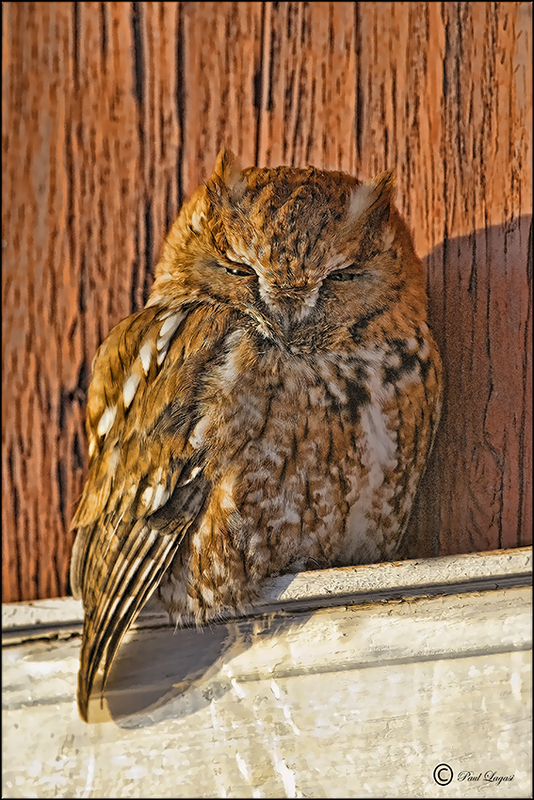 We followed him for about 5 minutes to Fitzroy Harbor and there above the entrance to his workshop was a lovely Red-phased Screech Owl. People had been going in and out of the shop all day and the Owl just rested there, he could not have cared less about us. He thought we probably couldn’t see him because of the red wall on the building. A very cool owl, I’d seen many Grey-phased Screech Owl’s in the Ottawaarea but never a Red-phased. We took a bunch of photo’s, the one below is one of the best. This entry was posted in Owls. Bookmark the permalink.